Margaret St. Clair is and was a well-known author of science fiction and one of few women working in the genre during the 1940s. I thought her biography would have been worked out by now, but that doesn't seem to be the case. I guess I'll just go step by step and try to clear up the misinformation or the lack of information on her life. First, Margaret St. Clair was born Eva Margaret Neeley on February 17, 1911, in Hutchinson, Kansas. The Neeley family was descended from Irish settlers of colonial North Carolina and from a soldier in the Continental Army. Her father was George Arthur Neeley, a Kansas lawyer and farmer born on August 1, 1879, in Detroit, a village in Pike County, Illinois. His father, George W. Neeley, was a twice-wounded veteran of the Confederate army and at various times a merchant, U.S. marshal, judge, sheriff, deacon, and farmer on 160 acres in the Cherokee Strip. George A. Neeley's mother and George W. Neely's wife was Mary Elizabeth Stephens. George A. Neeley was educated in Joplin, Missouri, and in Wellston, Oklahoma. He graduated from Southwestern Baptist University in Jackson, Tennessee, in 1902, and received his law degree from the University of Kansas in 1904. In 1908, he moved to Hutchinson, Kansas, and opened a law office. He also became active in business and acquired a large farm of 480 acres in western Kansas. (That's large at least for my home state. In western Kansas, that might be a pretty small spread.) 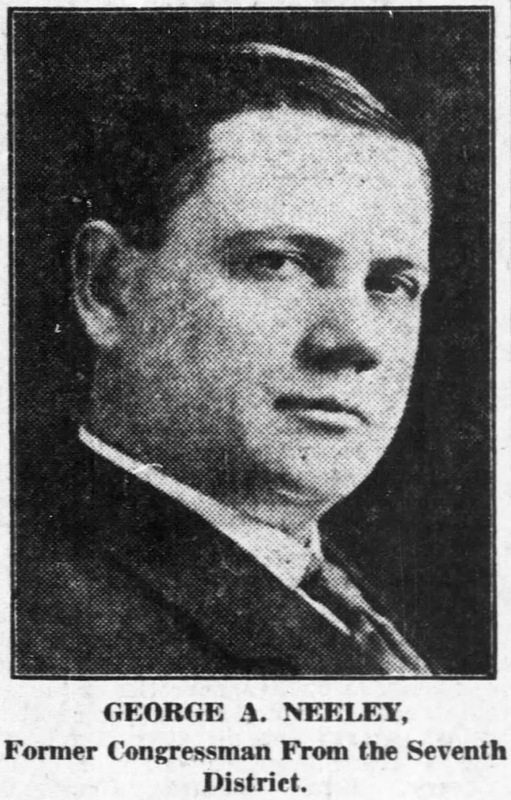 Neeley ran for the U.S. House of Representatives in 1910 but lost. He won a special election shortly thereafter and served in the Sixty-Second and Sixty-Third Congresses, in session from 1911 to 1915. On October 31, 1904, George A. Neeley married Elvira "Eva" Margaret Hostetler, a teacher, in Mulvane, Kansas. She was the daughter of Jonathan Newland Hostetler, a Civil War veteran on the Union side and a merchant and farmer from Indiana. Her mother was Martha (Fish) Hostetler. Elvira, or Eva, was born on September 19, 1875, in Bedford, Indiana. Her sister, Estella "Stella" Hostetler married another Kansas politician, future governor Walter Roscoe Stubbs (1858-1929), who was, incidentally, also a Hoosier. He was in fact governor when his niece, Eva Margaret Neeley, was born in 1911. George A. and Eva M. Neeley had two children, George Newland Neeley, born August 5, 1905, and Eva Margaret Neeley, born February 17, 1911. The younger George Neeley died on December 21, 1907, before his sister was born, thus Margaret St. Clair grew up as an only child. On the first day of January 1919, she became an orphan when George Arthur Neeley died in Hutchinson, Kansas. By the time of the 1920 census, Eva Neeley and her daughter, called Margaret E. Neeley, were living in Lawrence, Kansas. By 1930 they were in Santa Ana, California. I have gone into all this detail because no one else has. In my genealogical research, I find that when something seems amiss, it probably is amiss. (Or, as a fence-builder I knew in Missouri said when judging fenceposts, "If it looks crooked, it probably is crooked.") What is amiss is that Margaret St. Clair's identity seems to have been hidden for so long. I believe there's something to that, something revealing about an author who has been described as "elusive." Like her mother before her, Margaret St. Clair shed her identity: Eva Margaret Neeley became Margaret Neeley, then Margaret St. Clair. (She also used pseudonyms in her writing, though that practice was common among pulp authors.) She may have been following the example of her mother, Elvira Margaret Hostetler, who became Eva Neeley. (Eva Neeley seemed to have named her daughter after her own assumed identity.) After 1919, mother and daughter seem to have cut themselves adrift. Eva Neeley may very well have been independently wealthy upon the death of her husband. As she moved from place to place, she did not give any occupation. She and her daughter seem to have been two alone. Who now knows what their lives were like over those many years. In any case, nowhere that I have found does anyone point out that Margaret St. Clair was the daughter of a U.S. Representative. In her lifetime, she seems not to have revealed anything publicly of her origins or her childhood. And so only now, more than a century after her birth, does the truth come out. I find that curious in the extreme. So, Eva Margaret Neeley became Margaret Neeley before becoming Margaret St. Clair upon her marriage in 1932. Her mother, Eva Neeley, died on July 12, 1958, in Alameda County, California, at the age of eighty-two. By then Margaret St. Clair had become a successful writer of science fiction and fantasy tales. Yet she remained elusive. Revised October 3 & 7, 2017.